The leverage ratio requirement should supplement microprudential the risk-based capital requirements framework to serve as a backstop that ensures sufficient levels of equity in banks. However, the 3% level for this ratio should not be treated as the end-goal, as recent research on optimal capital levels points to substantially higher leverage ratios. This column examines the relationship between risk-based and leverage ratio requirements, and the motivation for the macroprudential use of leverage ratio requirements. 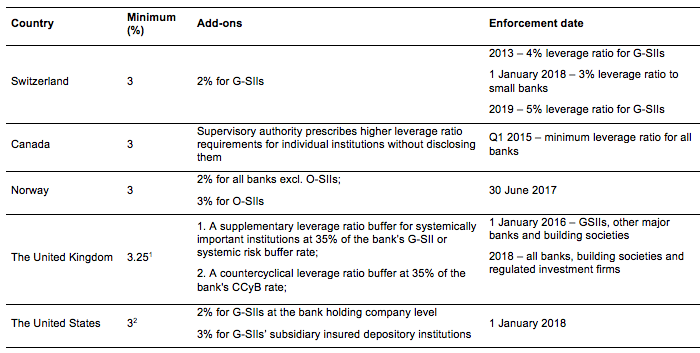 The leverage ratio requirement is part of the Basel III reforms, and it will be introduced as a Pillar 1 standard to supplement the existing risk-based capital requirements. Since 2015, the disclosure requirement has been in place, and banks have had to report their leverage ratio. Both the Basel Committee on Banking Supervision (BCBS) and the European Banking Authority (EBA) have expressed that the minimum microprudential leverage ratio requirement of 3% is appropriate. However, if the risk-weighted capital requirements are supplemented with additional (macroprudential) buffers, the leverage ratio requirement should be higher (in the range of 4-5%) to maintain its backstop role. A minimum leverage ratio requirement serves as the ultimate backstop against the shortage of equity based on risk-weighted capital requirements. It is calculated by dividing the amount of high-quality capital of a financial institution by its total non-risk-weighted exposure.1 Therefore, the leverage ratio requirement mitigates the sensitivity of risk-weighted capital requirements to fluctuations in the perceived riskiness of assets. The leverage ratio exposure measure differs from total assets. When calculating the leverage ratio exposure measure, off-balance sheet positions, such as credit line and credit card commitments or guarantees, and derivatives with modified ‘prudential’ value, are included.2 A higher leverage ratio broadly corresponds to a higher ratio of risk-weighted assets to total assets (see Figure 1), but is much more comparable across institutions and jurisdictions than risk-based capital adequacy ratios. The internationally agreed-upon level of the minimum leverage ratio requirement is 3%. At the beginning of the Basel III reforms, this level was binding for a number of banks. According to the BCBS (2010a), in 2009 large banks (with an average leverage ratio of 2.8%) were considerably more leveraged than smaller banks (average leverage ratio of 3.8%). By end-2016, banks’ capital positions improved significantly, with the average leverage ratio of large banks and G-SIBs being 5.8%, and for smaller banks 5.5% (BCBS 2017a). This increase was broadly in line with the increase of risk-weighted capital ratios and the gradual phase-in of macroprudential capital buffers. Subsequently, in 2016, the final minimum Basel III requirement was set at 3% (BCBS 2016). Notwithstanding the internationally agreed-upon minimum level, the BCBS (2017b) saw room to further increase the leverage ratio requirement for G-SIBs. To date, no country has followed one single framework when it comes to setting a leverage ratio requirement. Leverage ratio frameworks vary mainly with respect to the macroprudential tool – the size of add-ons and the types of institutions it is applied to. 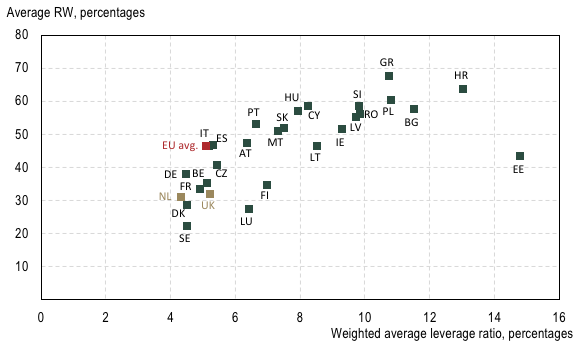 There are countries that have the leverage ratio requirement in place (Canada, Norway, Switzerland, the UK, and the US) and countries that have assessed the impact of the leverage ratio requirement (e.g. the Czech Republic, Denmark, the Netherlands, and Sweden). The US, the UK, Norway, and Switzerland have introduced the leverage ratio measure both as a microprudential and macroprudential tool, where the leverage ratio add-on complements the mandatory leverage ratio requirement of at least 3% (see Table 1). Notes: 1) In October 2017, the minimum leverage ratio requirement was increased from the previous 3%; 2) applied to advanced approaches banking organizations (loosely speaking, large banks), other banking organizations are subject to domestic leverage ratio requirements that differ in their definition from Basel III approach. The macroprudential leverage ratio add-ons are, in most cases, applied to institutions that are considered of systemic importance – that is, those whose failure might trigger financial turbulence and are often referred to as ‘too big to fail’, or carry out functions that are critical to the economy. The size of these macroprudential add-ons ranges up to 3%. Smaller banks are generally only subject to the minimum leverage ratio requirement, or at least the leverage ratio add-ons are smaller for them than for systemically important institutions (as in Norway and the UK). The leverage ratio requirement could be a ‘backstop’ for risk-weighted capital requirements, by ensuring that a financial institution has a minimum level of equity. It mitigates the weaknesses of risk-weighted capital requirements, which themselves mitigate the drawbacks of the leverage ratio, thus accentuating their complementarity (see Table 2). Since the leverage ratio measure does not require making a judgement on the riskiness of banks’ assets, it is simpler, more transparent and less subject to risk-weight arbitrage. Note: for the sake of simplicity, pros and cons are listed in the table as if the two kinds of requirements were applied independently, i.e. their interaction is not taken into account. In a recent paper, we argue that the optimal level of the leverage ratio should strike a delicate balance between serving as an appropriate backstop while also allowing risk-weighted capital requirements do their job when risk weights accurately reflect underlying asset risks (Valinskytė et al. 2018). Broadly taken, risk-weighted capital requirements are designed to cover ‘known’ credit losses, and this requirement dimension should be appropriate most of the time. However, on rare (but critically important) occasions, granularly estimated risk weights could get off track and significantly deviate from underlying risk levels (Figure 2). In such situations, the leverage ratio requirement, as a last line of defence, should stand at levels capable of absorbing an appropriate amount of ‘unknown’ credit losses. Some recent research points to the optimal risk-weighted capital level being in the area of 13.5–20%, thus, the optimal leverage ratio should be higher than 3%. Results from BCBS (2010b) were consistent with socially optimal Tier 1 capital ratios within a range of 16–19% (Brooke et al. 2015). Subsequent studies concluded that optimal capital levels could range from 13.5% (Bank of England 2015) to around 20% (Miles et al. 2013). Fender and Lewrick (2015), building on the results and conceptual framework of the BCBS (2010b), also suggest that the minimum leverage ratio requirement could be higher than the ‘test’ value of 3%, within a range of about 4–5%. Risk-weighted capital adequacy and leverage ratio requirements are related, as they both set the minimum capital amount a bank must hold. Depending on the riskiness of the bank’s assets, one of them is usually more constraining. The two requirements are quantitatively related through the so-called ‘critical average risk weight’ (CARW, see Table 3). Note: * Assuming an other systemically important institutions buffer of 2%. The relative stringency of risk-based and leverage ratio requirements for a bank depends on its average risk weight across the portfolio. For institutions that only just meet the required risk-weighted capital ratios, the leverage ratio acts as a floor on average risk weights. If the leverage ratio is held constant, different capital adequacy requirements lead to different CARW values. 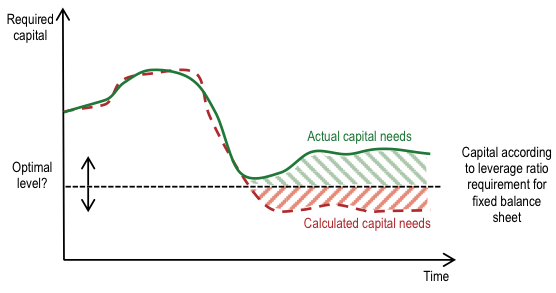 This means that, if capital adequacy requirements differ for banks while the leverage ratio requirement is the same, the backstop role of leverage ratio requirement will be distorted – banks with higher capital adequacy requirements will be allowed to have a lower average risk weight than the ones with lower capital adequacy requirements. Structural capital buffers (such as for globally significant institutions or systemic risk buffers), which are usually institution-specific and applied to a subset of institutions, could produce such variability among institutions. Time-varying capital buffers add to this distortion by generating variability in time. Macroprudential leverage ratio add-ons would help to maintain the constant backstop role of the leverage ratio requirement. The introduction of macroprudential capital buffers results in a higher capital adequacy requirement (CARW varies across institutions and time). An additional leverage ratio requirement would help to maintain constant CARW and hence, the same stringency of leverage ratio requirements across both institutions and time. The microprudential leverage ratio requirement will act as a backstop to existing capital requirements. This is particularly true for banks that employ low average risk weights. Although the international minimum leverage ratio requirement is set at 3%, this level should not be treated as a target. Based on recent research on optimal capital levels, the appropriate level of the leverage ratio requirement should be at least 4-5%. These levels could be achieved with macroprudential leverage ratio requirement add-ons. In practice, to avoid inconsistencies between the two kinds of capital requirements across institutions, the levels of the add-ons have to take into account different risk-based capital requirements that are applied to banks. Secondly, risk-based capital requirements include a time-varying component, namely the countercyclical capital buffer. Tailoring the leverage ratio requirement to changes in cyclical systemic risk could also improve the backstop role of leverage ratio across time. Bank of England (2015), “Financial Stability Report”, no. 38, December. BCBS (2010a), “Results of the comprehensive quantitative impact study”, report, December. BCBS (2010b), “An assessment of the long-term economic impact of stronger capital and liquidity requirements”, report. BCBS (2016), “Revised market risk framework and work programme for Basel Committee is endorsed by its governing body”, press release, 11 January. BCBS (2017a), “Basel III Monitoring Report”, September. BCBS (2017b), “Governors and Heads of Supervision finalise Basel III reforms”, press release, 7 December. Brei, M, and L Gambacorta (2014), “The leverage ratio over the cycle”, BIS Working Papers, No 471. Brooke, M, O Bush, R Edwards, J Ellis, B Francis, R Harimohan, K Neiss, and C Siegert (2015), “Measuring the macroeconomic costs and benefits of higher UK bank capital requirements”, Bank of England, Financial Stability Paper No 35. Fender, I, and U Lewrick (2015), “Calibrating the leverage ratio”, BIS Quarterly Review, December: 43–58. Miles, D, J Yang, and G Marcheggiano (2013), “Optimal bank capital”, Economic Journal 123: 1–37. Valinskytė, N, E Ivanauskaitė, D Kulikauskas, and S Krėpšta (2018), “Leverage Ratio as a Macroprudential Policy Instrument”, Lietuvos Bankas Occasional Paper Series No 18/2018. The leverage ratio indicator represents the ratio of capital to assets, in line with the definitions of existing supervisory requirements for a financial institution’s own funds. The term leverage is often used to denote the degree to which a bank‘s assets exceed its own funds. Therefore, setting the minimum leverage ratio requirement implies setting the maximum leverage level for a given institution. One of the intermediate objectives of macroprudential policy, namely to ‘mitigate and prevent excessive leverage’, is expressed in terms of the latter definition. Details of the calculation of the leverage ratio exposure measure have been evolving over time; moreover, there are some discrepancies between the BCBS and EU definitions. Still both leverage ratio and capital adequacy ratios tend to portray some countercyclical properties during a crisis period.